Life Without A Sense Of Smell Can Be Scarier And Less Tasty : Shots - Health News Some people are born with anosmia — the inability to smell. Others lose their sense of smell later in life. That makes it hard to taste food, detect threats, or even savor memories. Nisha Pradhan is worried. The recent college graduate just turned 21 and plans to live on her own. But she's afraid she won't be able to stay safe. That's because Pradhan is anosmic — she isn't able to smell. She can't tell if milk is sour, or if she's burning something on the stove, or if there's a gas leak, and that worries her. "It actually didn't even strike me as being a big deal until I got to college," Pradhan says. Back home in Pennington, N.J., her family did her smelling for her, she says. She's moved in with them for now, but she's looking for a place of her own. "Now that I'm searching for ways or places to live as an independent person, I find more and more that the sense of smell is crucial to how we live our lives," Pradhan says. There's no good estimate for how many people live with smell loss. 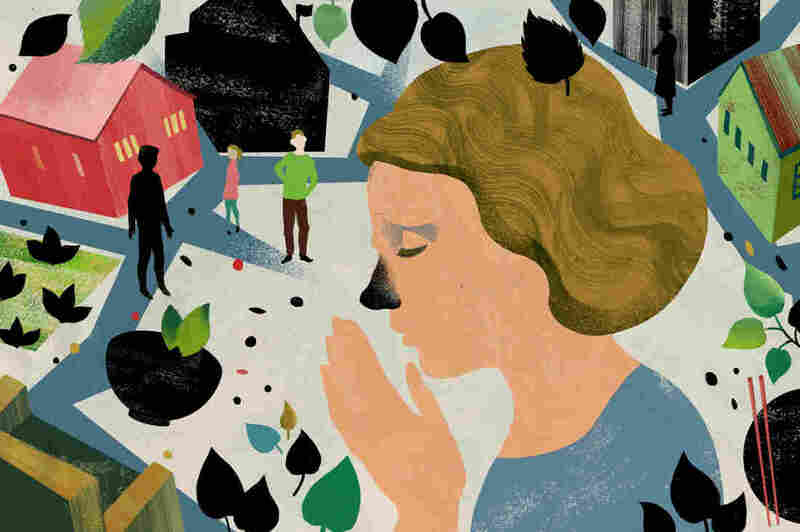 Congenital anosmia, being born without a sense of smell, is a rare condition. Acquired smell loss is more common. That loss can be total, or what's known as hyposmia, a diminished sense of smell. Pradhan doesn't know how she lost her sense of smell. She thinks she was born with it because as a child, she says she liked to eat and ate a lot. But there came a point where she lost interest in food. "That's actually one of the first things that people notice whenever they have a smell problem, is food doesn't taste right anymore," says Beverly Cowart, a researcher at the Monell Chemical Senses Center in Philadelphia. That's because eating and smell go hand in hand. How food tastes often relies on what we smell. "When you lose your sense of smell, your whole sense of food flavor is distorted and diminished," Cowart says. "You can still taste the basic tastes which are sweet, salty, sour, bitter, and umami or savory. What you're missing are the sort of subtle distinctions, the difference between strawberry and banana; between chocolate and vanilla." And that can make eating a dull experience for anosmics. "When I go out to eat — it might be Mexican, Chinese, Italian — I have often found that that food is very bland to me. I never feel full. I never feel a sense of contentment," Pradhan says. When socializing centers around eating, Pradhan says she sometimes feels left out. "I think a lot of us today like to pretend or be foodies and we all like to talk about 'Oh, I think this could use a little bit more lemongrass,' or 'I think this has a hint of cinnamon.' I can't really participate in those conversations," she says. People need olfactory receptor neurons to smell. These nerve cells come into direct contact with the air we breathe. They then pass from the upper part of the nose to the brain through a honeycomb-like structure called the cribriform plate. "These neurons are going from the nose directly to the brain and connecting to the olfactory bulb. They're really the only nerves in the body that interact directly with the environment that way," Cowart says. Because of that, the neurons are vulnerable. Damage to the cribriform plate, say from a head injury, can crush or sever them. Things we inhale can also harm them. "Their function is to detect chemicals, and chemicals can sometimes be toxic," Cowart says. "They can also be damaged by viruses. Simple cold viruses will sometimes seem to attack those receptor neurons and cause a longer-term loss of smell due to damage to those neurons." Aging also plays a role, as the neurons dwindle over time. The replacement process isn't perfect, and it may also tend to slow down with age. "So a very large proportion of the population has some degree of smell loss in their 60s, 70s and 80s," Cowart says. Smell loss might cause some older people to over-season food or lose interest in eating. There's also evidence that smell loss may be an early indicator of Alzheimer's and other neurodegenerative diseases. In spite of her smell loss, Pradhan still loves to cook. She even ran a food blog called "Anosmic Chef." She favors foods that are spicy, a quality she can still detect. What we think of as food "flavor" is actually a combination of things: odor; taste (sweet, sour, salty, bitter, umami); and chemosensory irritation. Chemosensory irritation includes sensations like warmth, cooling and pungency. Those signals are carried to the brain via the trigeminal nerve, which is separate from the olfactory system and unaffected by Pradhan's anosmia. "So the kinds of sensations you get from that are like the coolness of menthol, the spiciness of hot peppers or mustard," Cowart says. Pradhan wonders whether her anosmia has affected more than her appetite. She thinks it also may have affected her memory. Remember the smell of your elementary school cafeteria or the perfume of your first crush? That feeling — where a certain smell instantly takes you back — doesn't happen for Pradhan. And she's afraid it means parts of the past are missing. "When I ask my sister about this, and she and I are not very far apart in age, she remembers people and places and things we've done more vividly than I do," Pradhan says. Pradhan may be on to something, according to biologist Paul Moore, author of The Hidden Power of Smell: How Chemicals Influence Our Lives and Behavior. That's because smell memories are created in a different way than other memories. When you smell something, he says, it triggers a response in the limbic system – what he calls the emotional part of the brain. "When olfactory signals come in, you feel about them first. And then you think about it and then the memory is laid down," Moore says. So without the feeling part, the thinking about it part doesn't come. And that means no new smell memory gets created, according to Moore. There's no cure for congenital anosmia. Doctors can treat the inflammation or nasal blockage that may be causing acquired smell loss. If the damage isn't too great, sometimes a sense of smell returns. But it could take years. Some people have found hope in "smell training" — a sort of brain retraining program for anosmics who have regained at least a bit of their ability to smell. Researchers are also studying stem cells, to see if they can coax them into becoming new olfactory neurons. But human trials are years away, Cowart says. Smell has been shorted when it comes to research, says Moore. "We undervalue smell so much that there is very little research into curing anosmia," he says. Pradhan, who studied biology and hopes to go to medical school, thinks there probably won't be a cure for her anosmia anytime soon. "I know a little bit about how research works and how long trials take to get medications or therapies out," Pradhan says. Her biggest concern right now is: "Can I really trust myself to live on my own?" At home in New Jersey, she's reinforcing her strategies for staying safe –double checking the stove and making sure the smoke alarms are working. And she hasn't ruled out a roommate. Annette Heist is a freelance writer and radio producer who's also a registered nurse. You can find her on Twitter: @AnnetteHeist.